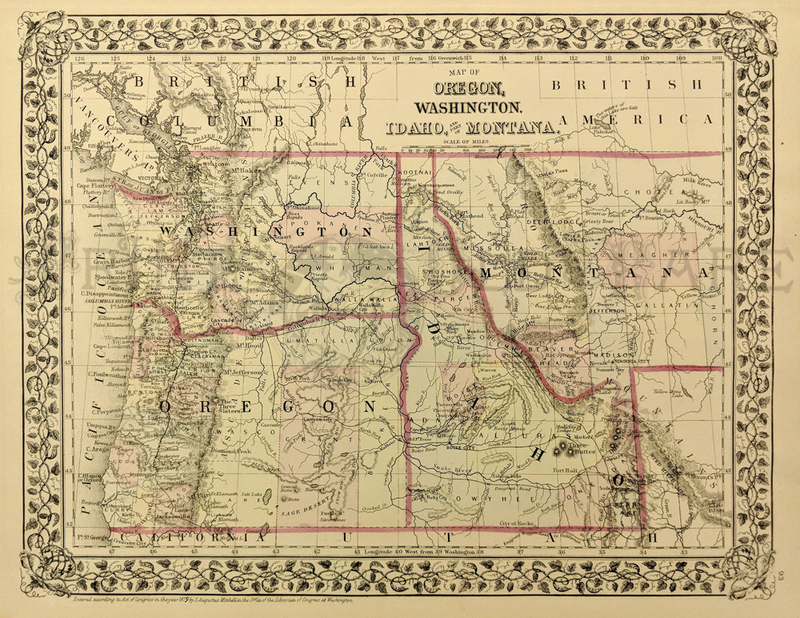 Antique Montana Prints and Maps for sale. Riviere Des Lacs to the Rocky Mountain. From Ft. Pierre to vicinity of Helena Montana. 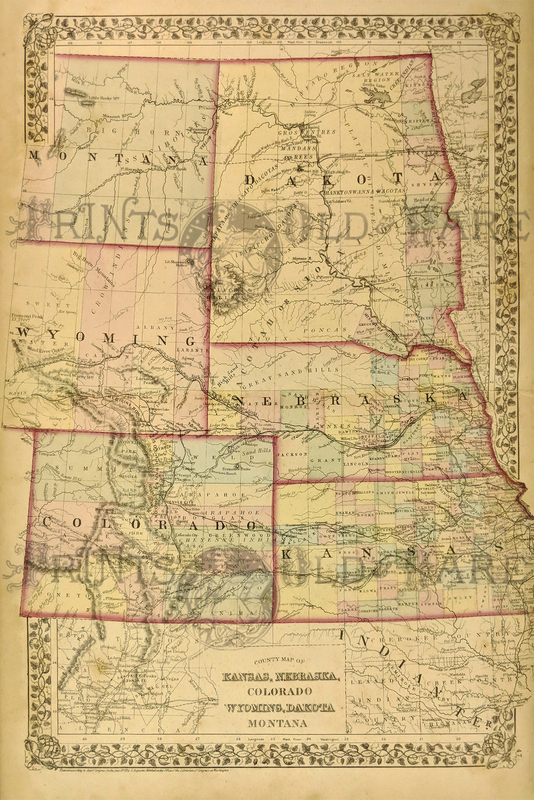 1853 US Railroad Survey. Shows Missouri River and Camp areas. 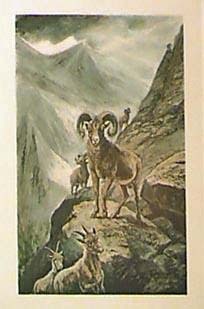 Lightly tinted lithograph. Water colored. Produced by War Dept. under Jefferson Davis and Isaac Stevens. 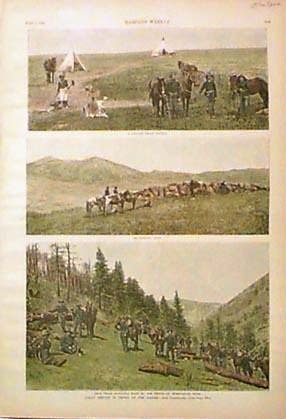 1888 Indian Service of Troops, Montana border. Three hand colored views on one page. 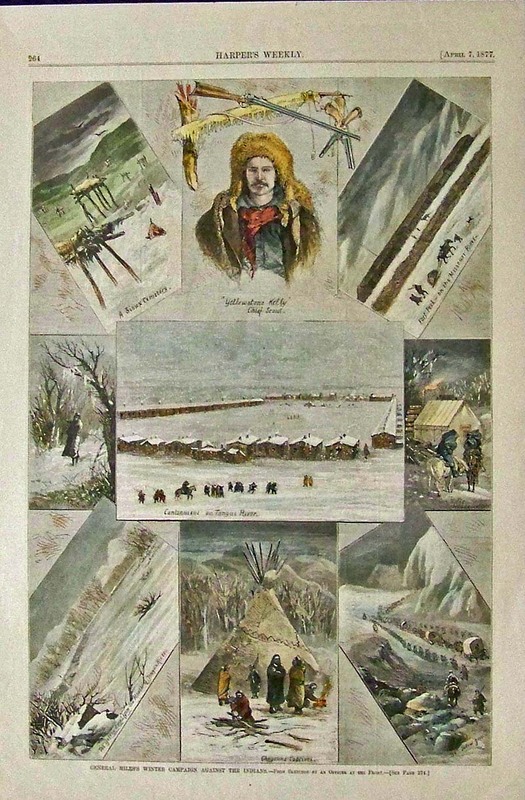 1877 Harper's Weekly hand colored wood engravings showing General Miles's Winter Campaign Against the Indians, from sketches by an Officer at the Front in that era. 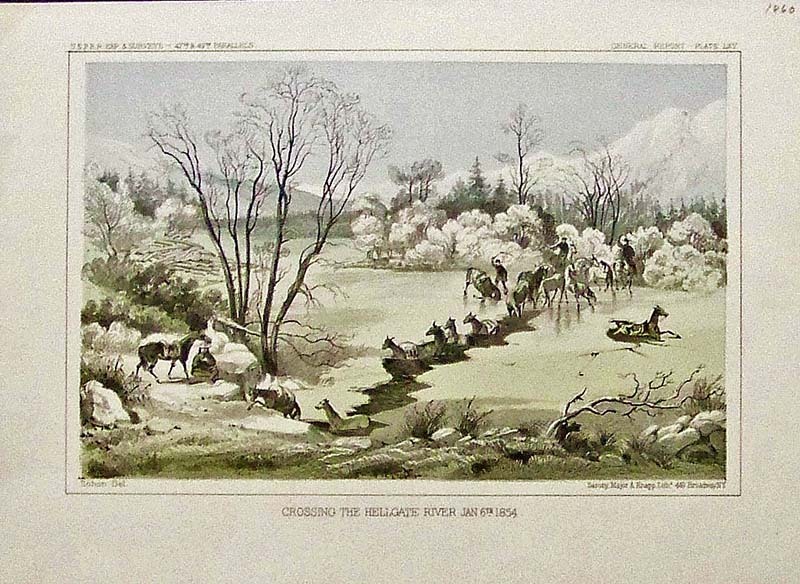 1860 USPRR General Report - Plate LXV hand colored lithograph titled, "Crossing the Hellgate River, Jan. 6th, 1854." 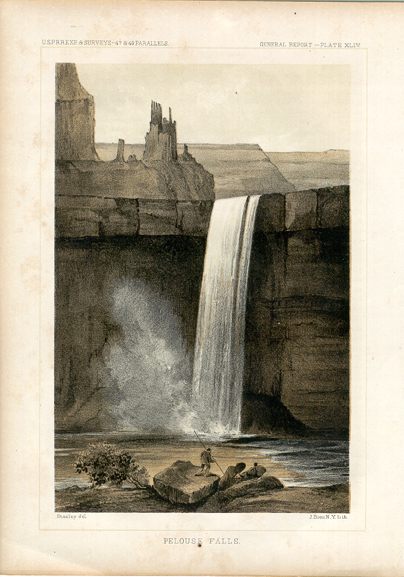 Lithograph by Sarony, Major & Knapp. 1855 USPRR Exp. 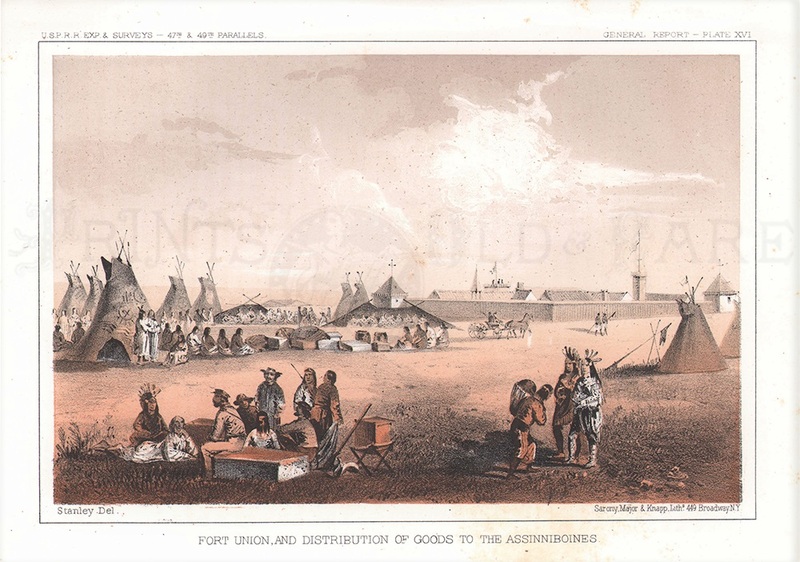 & Surveys - 47th & 49th Parallels hand colored lithographed General Report - Plate XVI titled, "Fort Union, and Distribution of Goods to the Assinniboines." 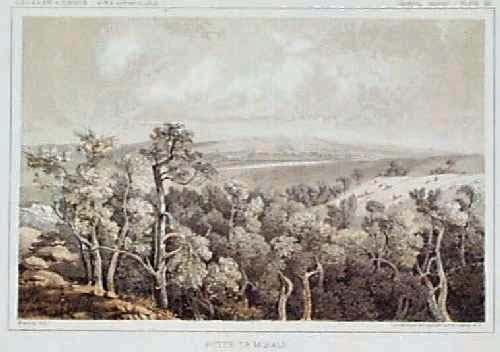 Lithograph by Sarony, Major & Knapp. 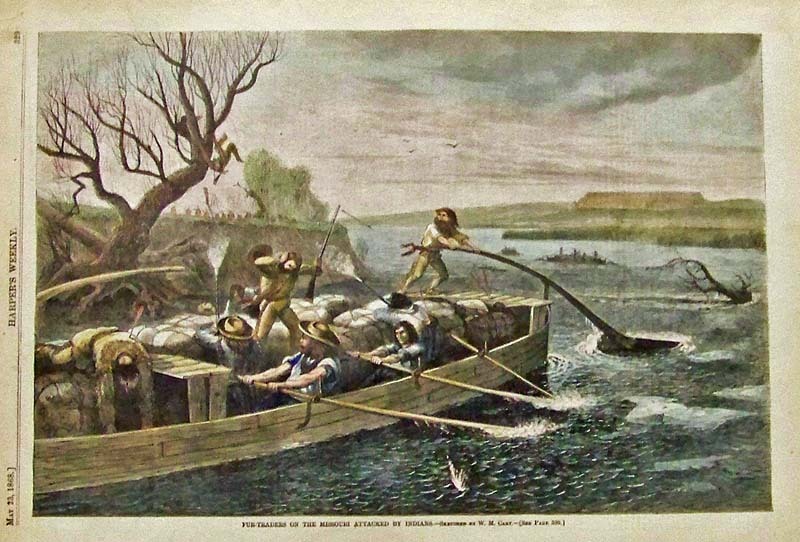 1868 Harper's Weekly hand colored wood engraving titled, "Fur-Traders on the Missouri Attacked by Indians." Sketched by W.M. Cary. 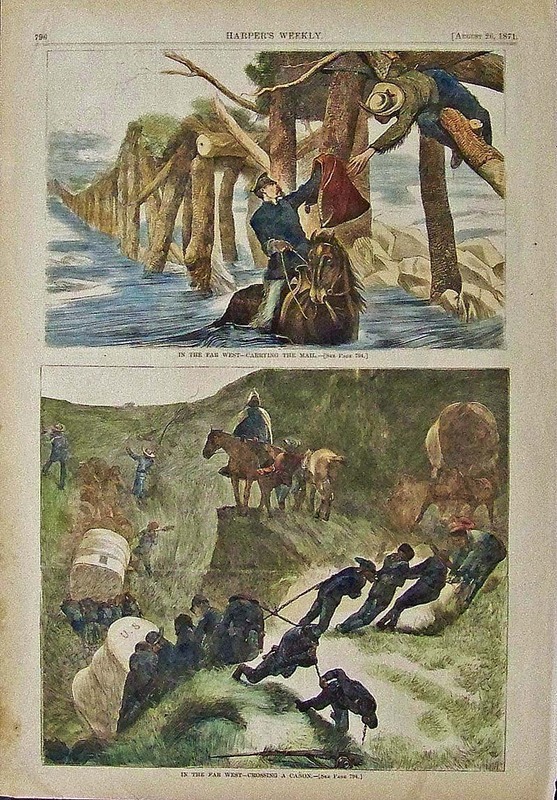 1871 Harper's Weekly hand colored wood engraving showing Carrying the Mail in the Far West in upper image and Crossing a Canon in the Far West in lower image. 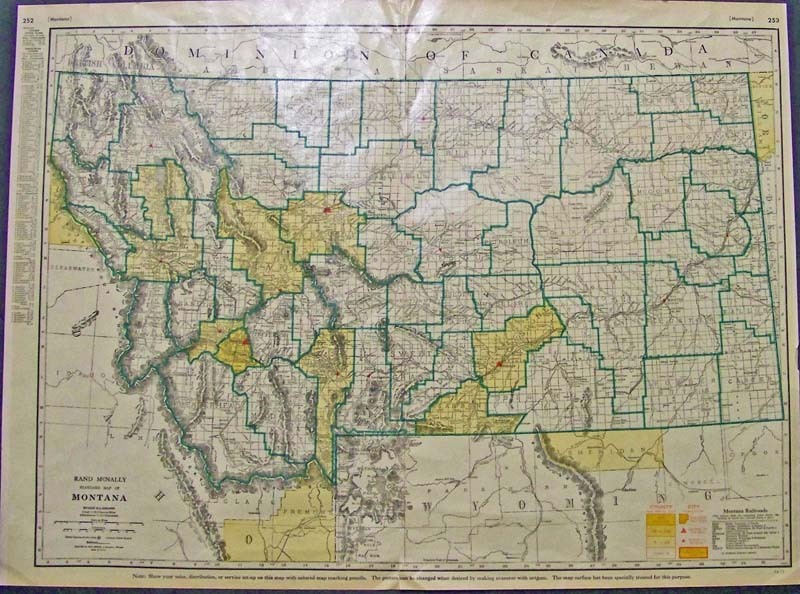 1912 Color Rand McNally New Commercial Atlas Map of Montana showing the Montana Railroads and electric lines Key to railroads is in bottom right of map and a Principal Cities guide is in left border. 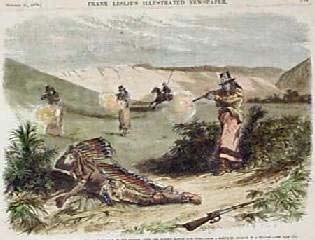 1876 Sioux Indian War Scenes in Montana. 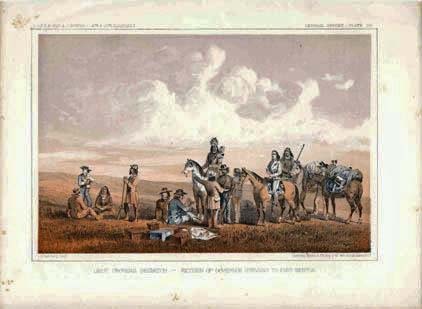 Five hand colored, engraved images from the U.S. Army's campaign against the Sioux Indians. 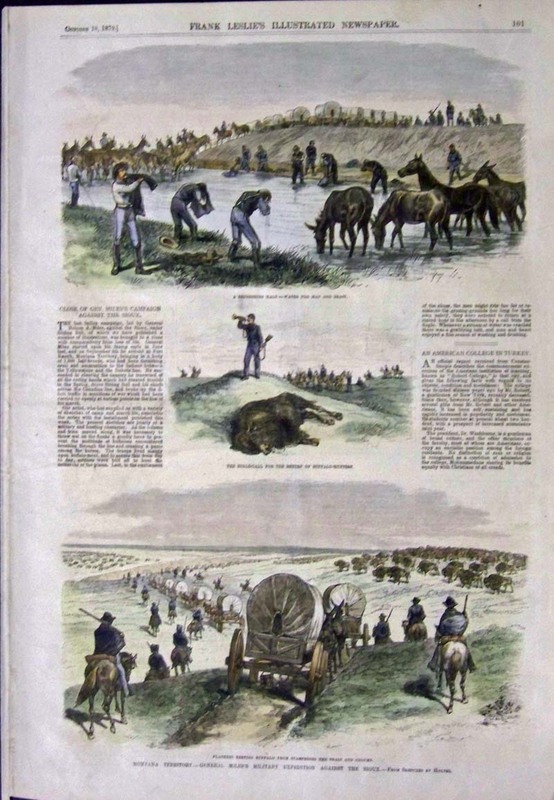 Each image has its own subtitle: 1) Massacre Monument; 2) Rosebud River, from the North Side of the Yellowstone; 3) Crook's Fight on Tongue River, June 9; 4) Crook's Supply Camp, on Tongue River, Mouth of Prairie Dog Creek; and 5) Fort Fetterman. 1855 Lieut. Crovers Desptch- Return of Governor Stevens to Fort Benton. 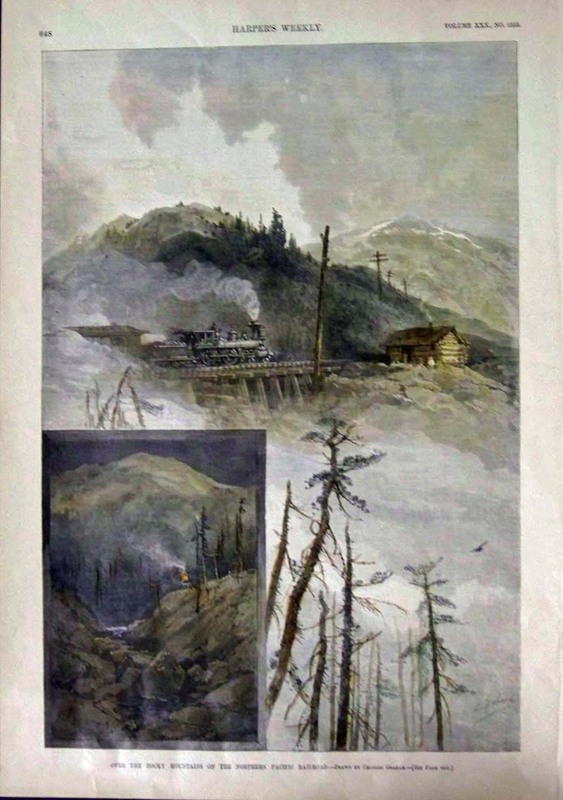 Railroad Survey litho view published by U.S. Government. 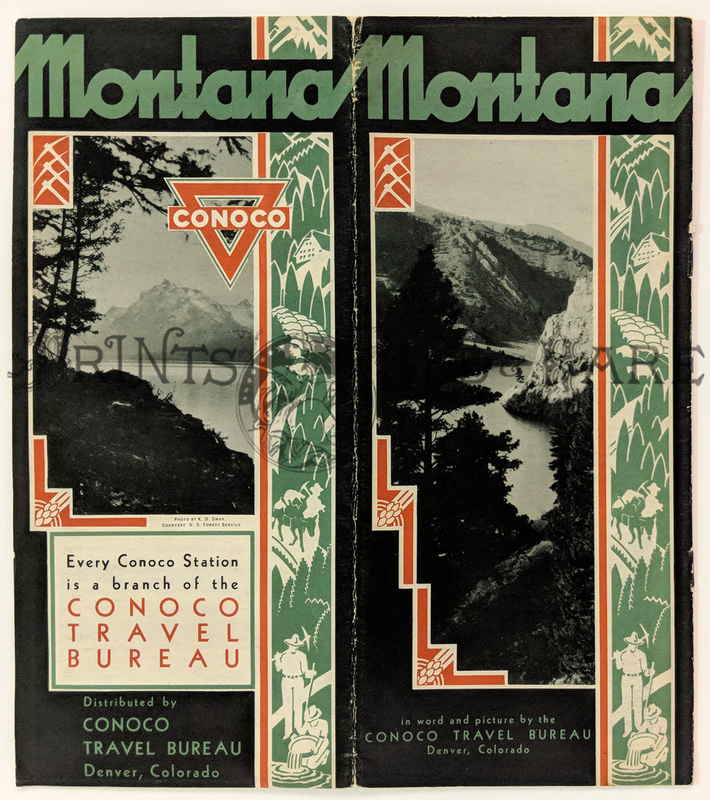 1932 Montana Tourist Brochure by Conoco. 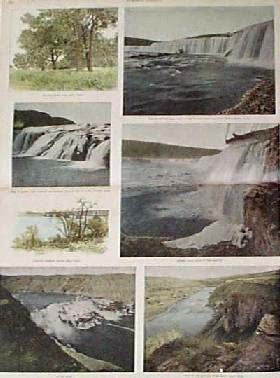 Four-page brochure with photos and descriptions of interesting landmarks in the state of Montana. Published by the Conoco Travel Bureau in 1932. 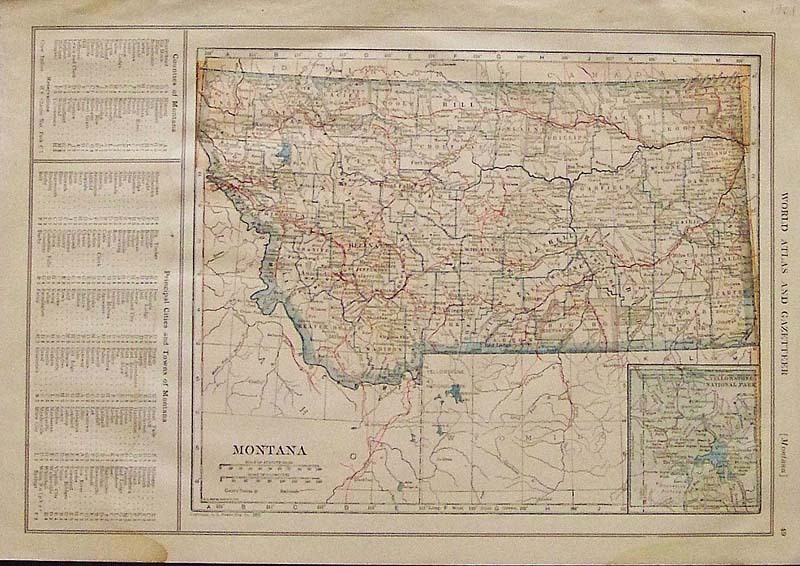 Also contains an index to points of interest in Montana, to be used with Conoco’s road map of the state. Very good condition. Helena Birdseye View. 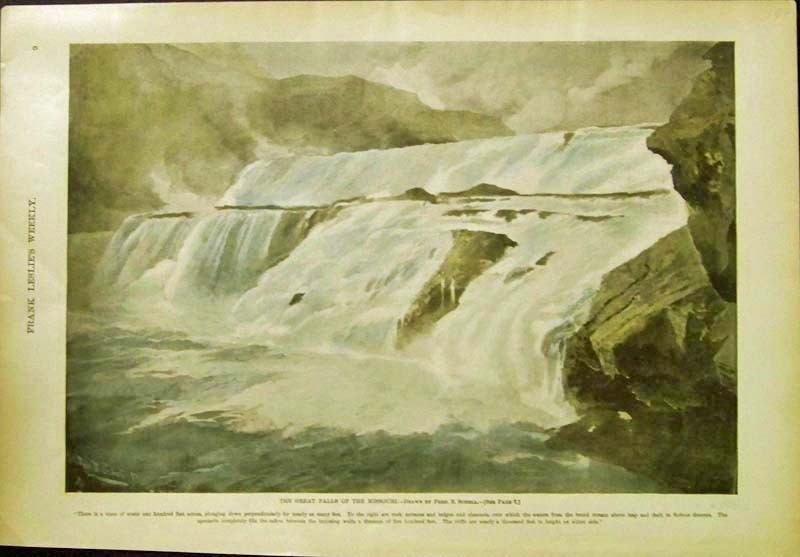 Large & magnificent lithograph - lightly tined. 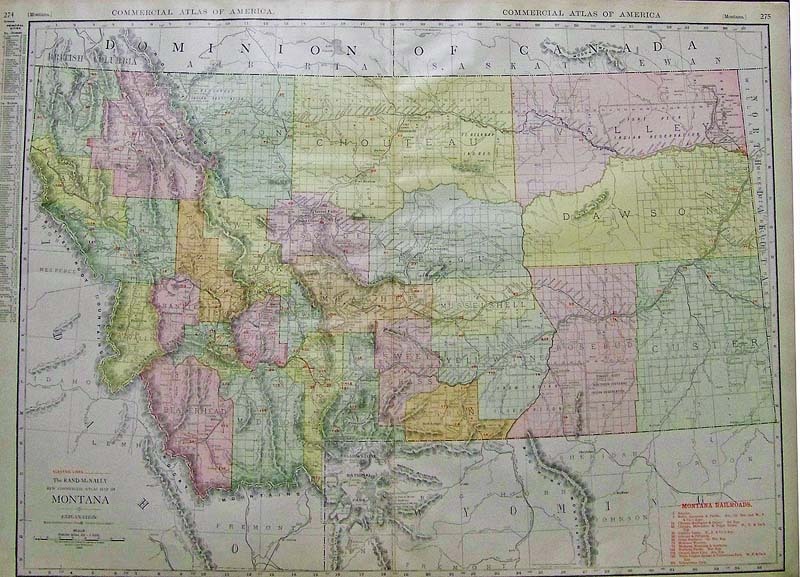 "Perspective Map" 1890. Compliments of Kessler Brewery. 17 inset views also map keyed with over 50 locations. Fine condition. 26 1/4 x 39 1/2 in. 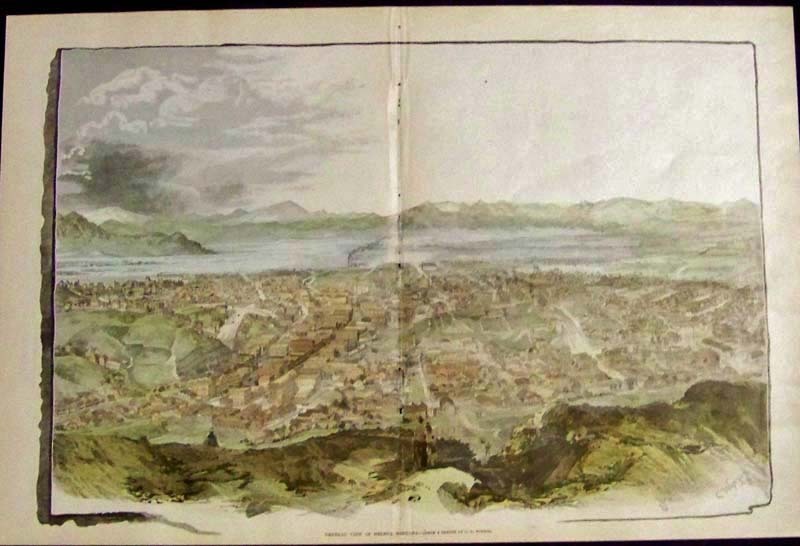 1890 Rare double-page hand colored wood engraving titled, "General View of Helena, Montana," from a sketch by C.D. Winsor. 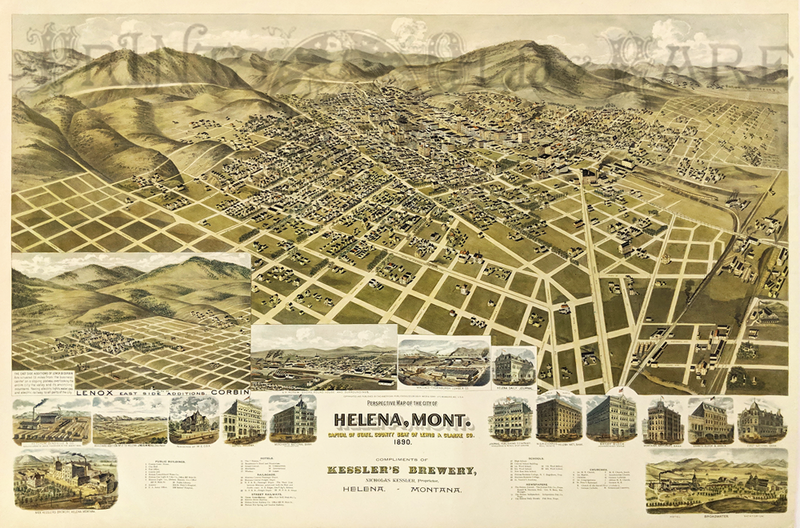 Image shows a bird's-eye view of Helena, Montana. 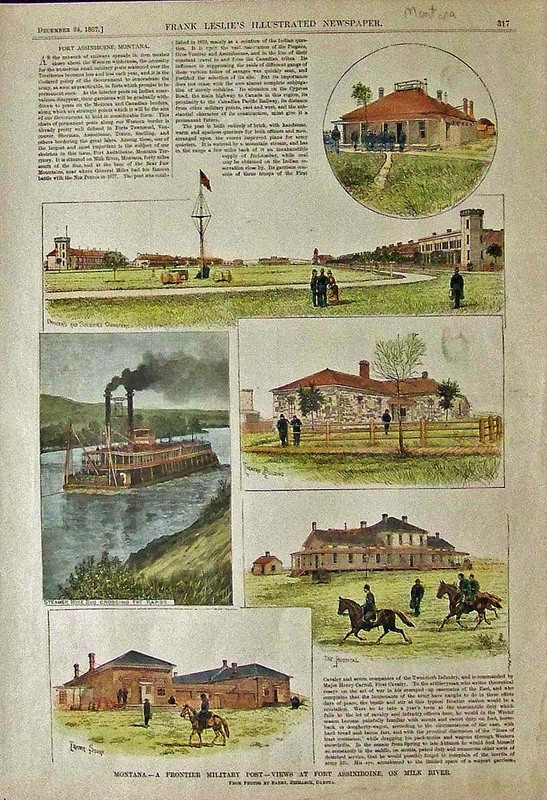 Page was featured in the Northwest Magazine in June of 1890. 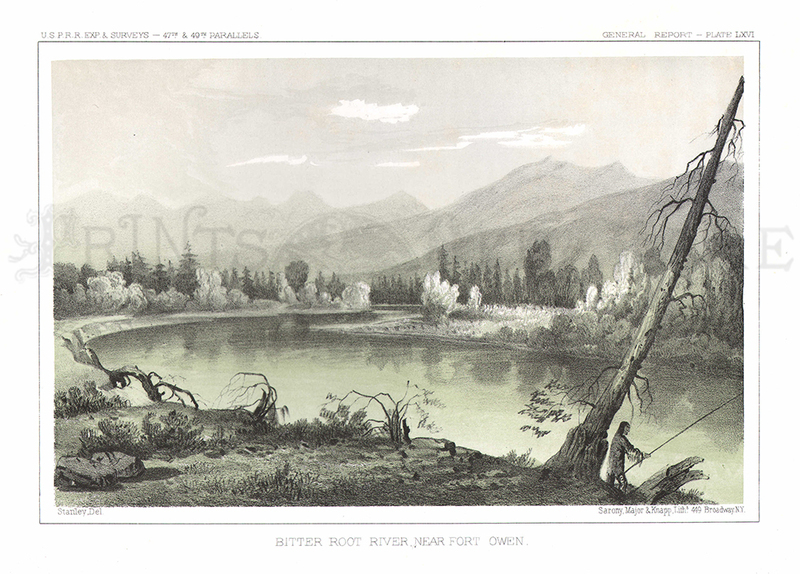 Pictorial Map – Glacier Waterton International Peace Park. 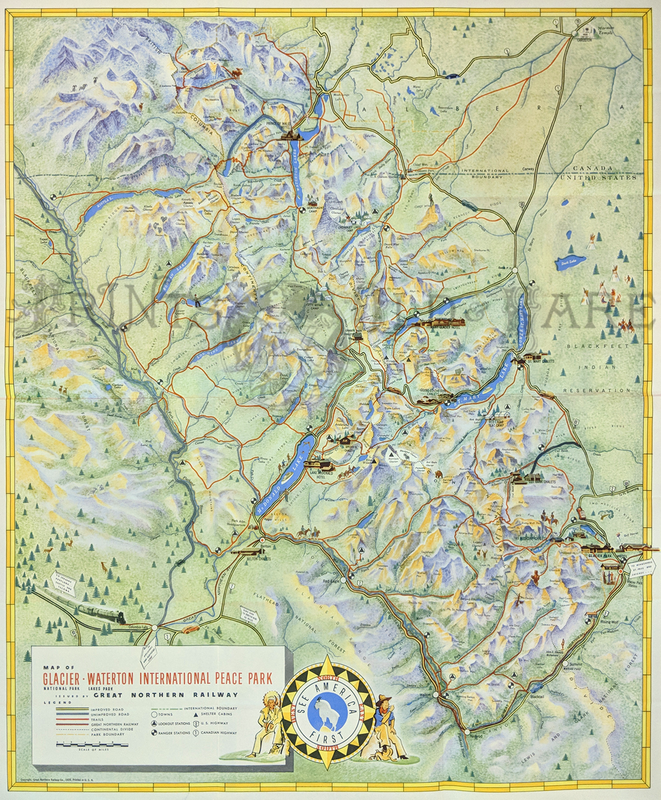 1939, by Great Northern Railway Co. Shows roads, trails, railroads, cabins, ranger stations, and highways. Milk River to Crossing of Columbia River. 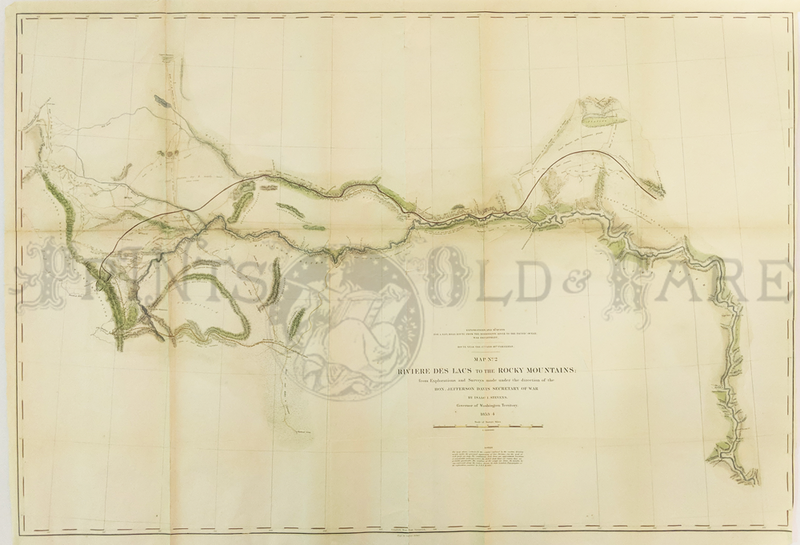 Large map from US Railroad Survey (1855) Expedition led by Gov. Stevens of Washington Territory. Shows rivers, routes, topography. Hand Colored lithograph - Orignally folded. 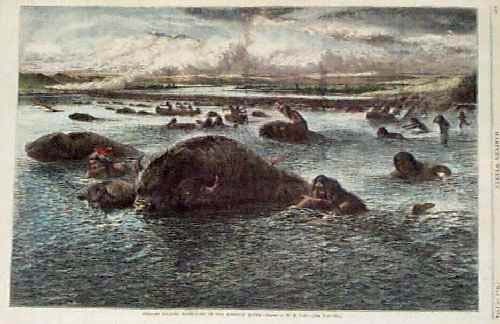 1886 Hand colored half-tone engraving featured in Frank Leslie's Weekly by the artist Fred. 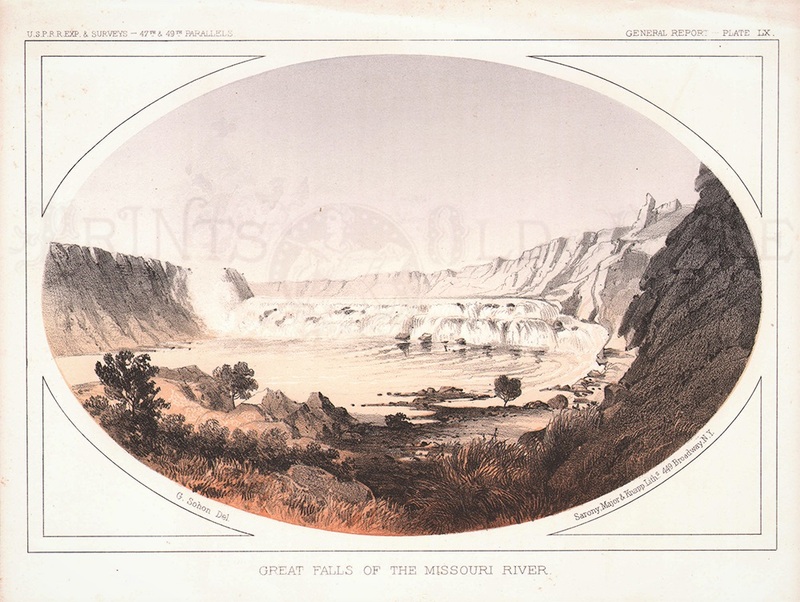 B. Schell titled, "The Great Falls of the Missouri." 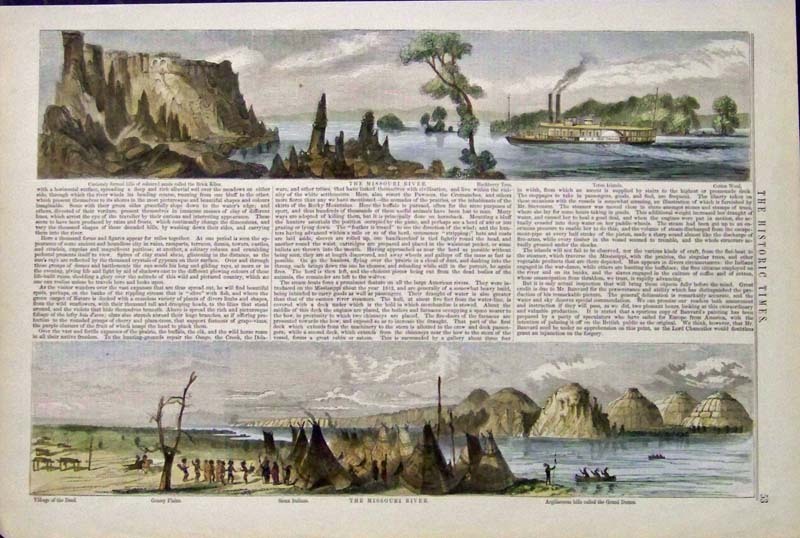 Hand colored wood engravings featured in The Historic Times which include text on the Missouri River. 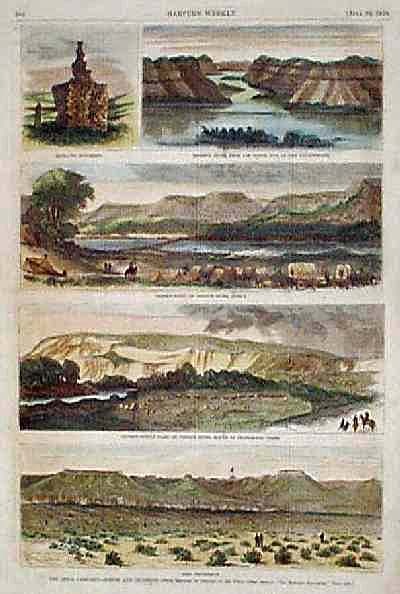 Top image shows the Missouri River and bottom image shows Indian territory on the Missouri River. 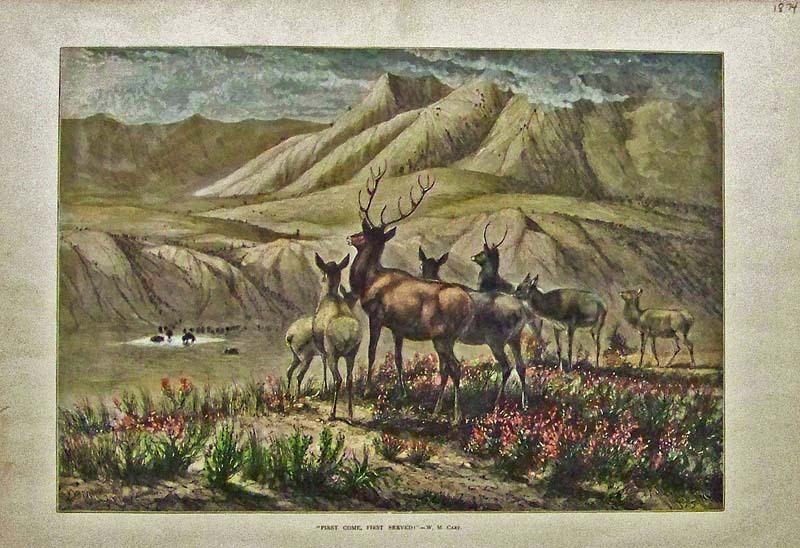 1887 Hand colored wood engraving featured in Frank Leslie's Illustrated Newspaper titled, "Montana -- A Frontier Military Post -- Views At Fort Assiniboine, On Milk River." 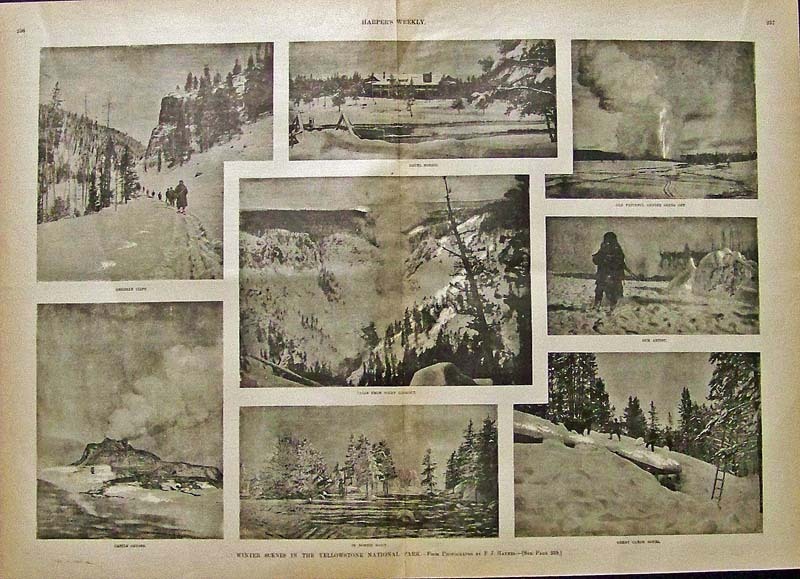 From Photographs by Barry, Bismarck, Dakota. 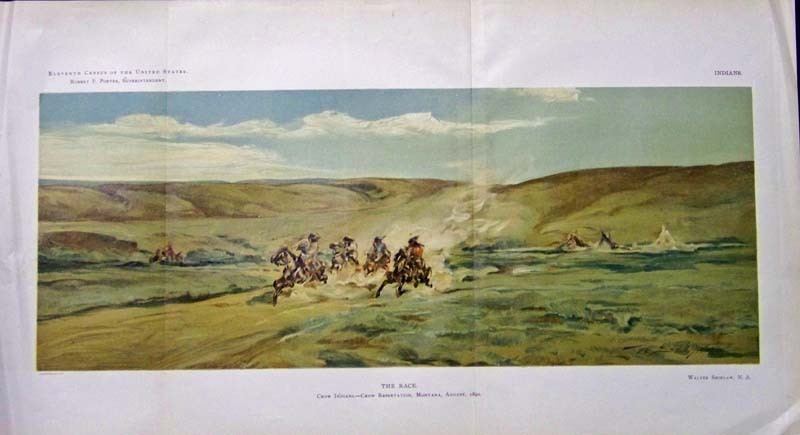 1894 Chromolithograph titled, "The Race." Image shows Crow Indians, -- Crow Reservation, Montana, August, 1890. Featured in the Eleventh Census of the United States, Robert P. Porter, Superintendent. 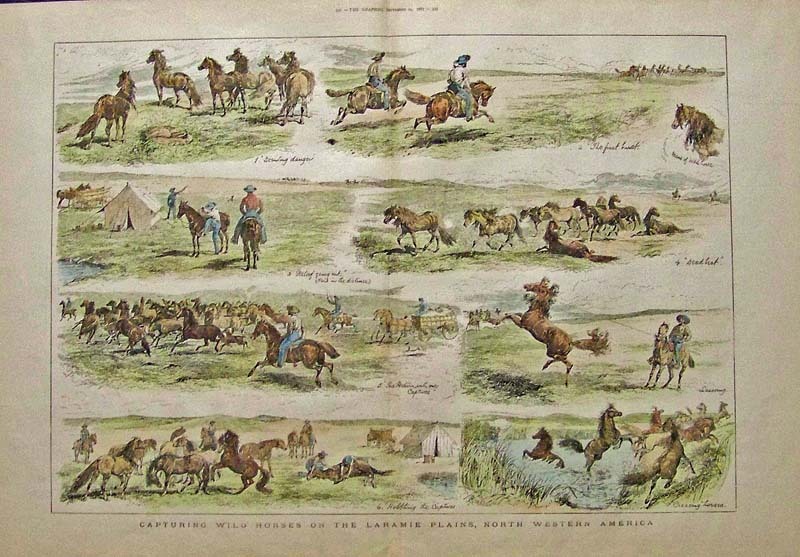 1879 Hand colored wood engraving featured in Frank Leslie's Illustrated Newspaper titled, "Montana Territory, -- General Mile's Military Expedition Against the Sioux." From Sketches by Holtes. 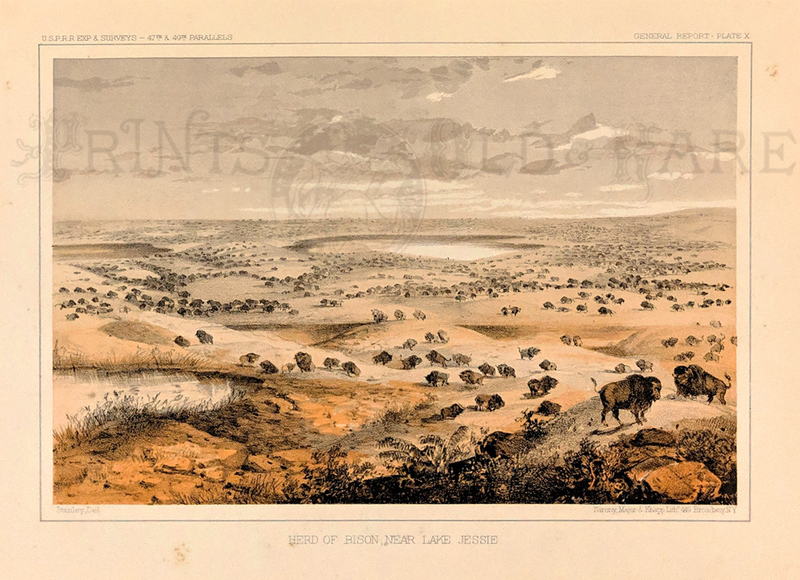 1855 Color lithograph titled, "Herd of Bison, Near Lake Jessie." Sarony, Major & Knapp, Lithographers. Featured in the U.S.P.R.R.